Posts related to the intranet content – the written word, photos and video, plain English, writing for an online audience. 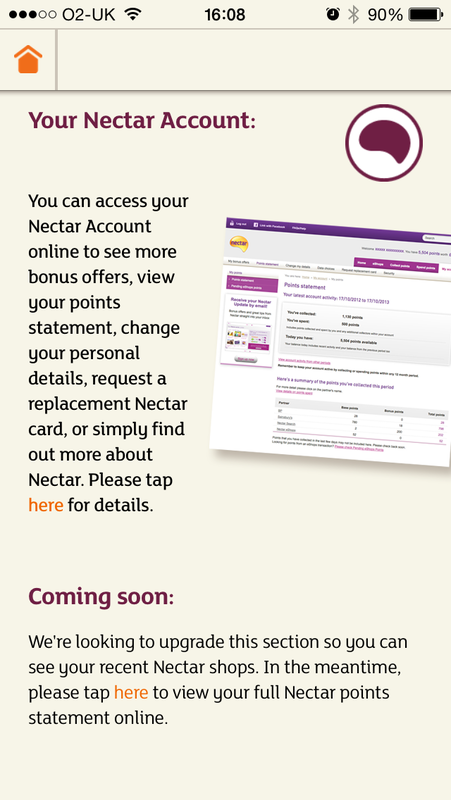 I’d been waiting with anticipation for our latest client intranet launch. It’s the nearest I’ll ever get to fatherhood, but these past weeks I’ve been acting like I’m looking after a newborn. After a little intensive care, the CCS intranet is up and running. 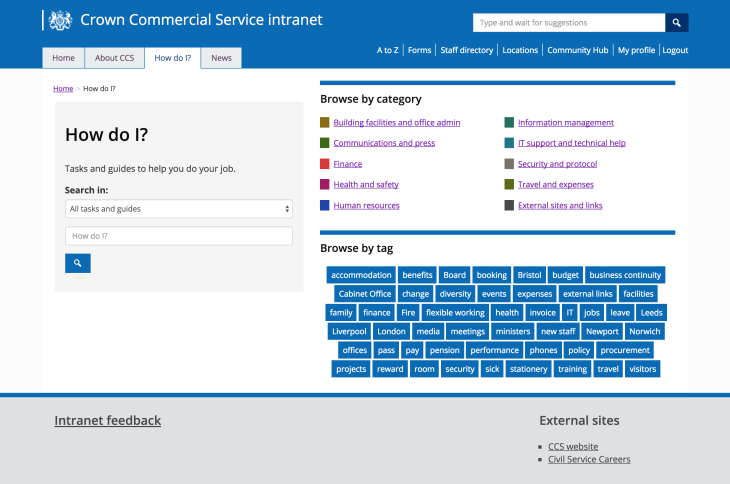 A real staff-centred intranet, it has a staff directory, forums, blogs, commenting and feedback forms. Looking from the outside, the launch seemed like it was first day at the sales. Okay so that’s a bit of an exaggeration, but what I’m trying to say is that staff haven’t been backward about coming forward. The trusty feedback form, at the bottom of every page, is producing a steady flow of comments from staff. Broken links, missing documents, factual corrections. And the comms team have been straight on the case, correcting problems, adding new content, keeping in touch with staff. Apart from the general positivity, staff are pointing out specific areas that they like; the staff directory, the search function, the simple content and IA. Being part of the Cabinet Office, CCS uses Google Apps. The majority of forms, policy documents and templates are stored on Google Drive. In hindsight, this was probably a blessing when it came to content migration as all those documents still live on Google Drive, leaving the intranet free for some good ol’ plain English content. The CCS intranet is behind a firewall, but staff still have to login to view the intranet. The good news is that it’s just a button click to login via their Google accounts. A combination of plugins handle the security authentication, and automatically create staff profiles on the intranet, pulling information from Google accounts, including avatars. It’s been amazing to sit on the sidelines and watch the staff directory grow from the dozen or so editors who first attended training, to the full workforce of around 500 staff. All with a click of a button. The plugins also allow editors to insert links to documents, or even embed documents in intranet pages using a simple search and click interface, integrated with Google Drive. A great way to maintain one source of truth, documents are kept up to date in Google so the intranet doesn’t become blocked with numerous versions of documents. The team have had the usual challenges when departments are faced with rewriting content. The usual objections from HR staff who are used to writing in official language and stock-piling documents into some electronic receptacle. But the comms team have triumphed. The intranet is not filled with endless left-hand menus representing the HR policy structure. Staff are finding information. Bite-size pieces, helping them to do their jobs. With the number of government intranets that I have a window into, it’s a little hobby of mine to compare content, to see how teams do things. This exercise can be useful when trying to demonstrate that content doesn’t have to be written like a policy document. Take whistle-blowing for example. On one of my client intranets, the guidance for this is a few short paragraphs; this is what it is, this is what you need to do, this is how you do it. On another client intranet the guidance is a mile long, starting with an introductory letter by the Perm Sec, followed by all the clauses of the policy, nicely numbered of course, ending with what you actually need to do. Which version helps staff and which helps the HR department, with their commitment to excellence, to tick their boxes? After initial ideas of creating an intranet launch video (and me getting excited about the chance to appear on Ellen’s wall) the team decided to go with an intranet treasure hunt instead. Being the geek that I am, I spent a weekend afternoon planning and plotting a complex operation involving time-locked pages and a secret safe, within a vault, within a building. 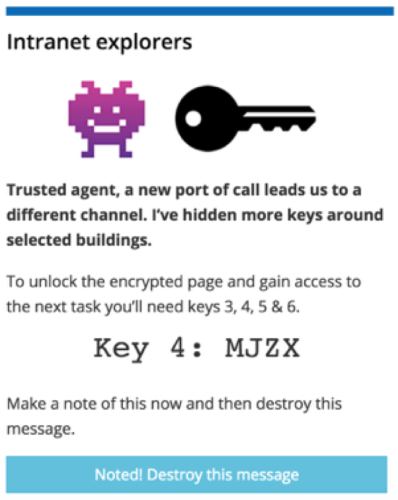 And having been reminded that staff are actually awfully busy and that maybe I should have been a games designer, they’ve opted for a simple mission of finding four keys, hidden around pages on the intranet. The mission takes staff through four sections of the intranet as they collect keys containing the combination to unlock the vault (or the password to unlock the WordPress page, to those in the know). We didn’t want to plaster the intranet with treasure hunt posters, should there be any staff not game enough to take part. 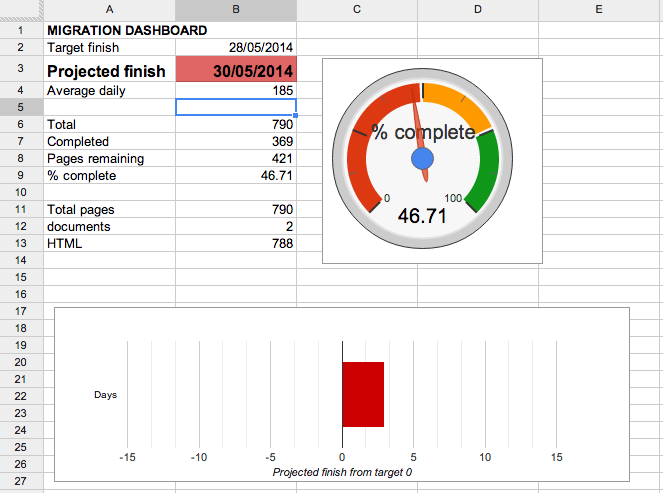 So we did it with intraverts, a feature of GovIntranet that allows targeted messaging. We created a new team called “Intranet Explorers”, to last for the duration of the treasure hunt. We encouraged staff to add this team to their staff profile if they wanted to take part. Then we crafted some intraverts to appear on selected pages around the intranet, only visible to members of the explorer team. For me, it’s been a mission of my own to come up with the concept and orchestrate the pages and intraverts. For the comms team, it’s been a way to introduce staff to sections of the new intranet and to familiarise them with searching and navigating the intranet structure. Hopefully, it’s been a bit of fun for all of us. The end of the hunt contains a very quick satisfaction survey where staff are asked to choose from a list of positive and negative statements regarding the intranet. 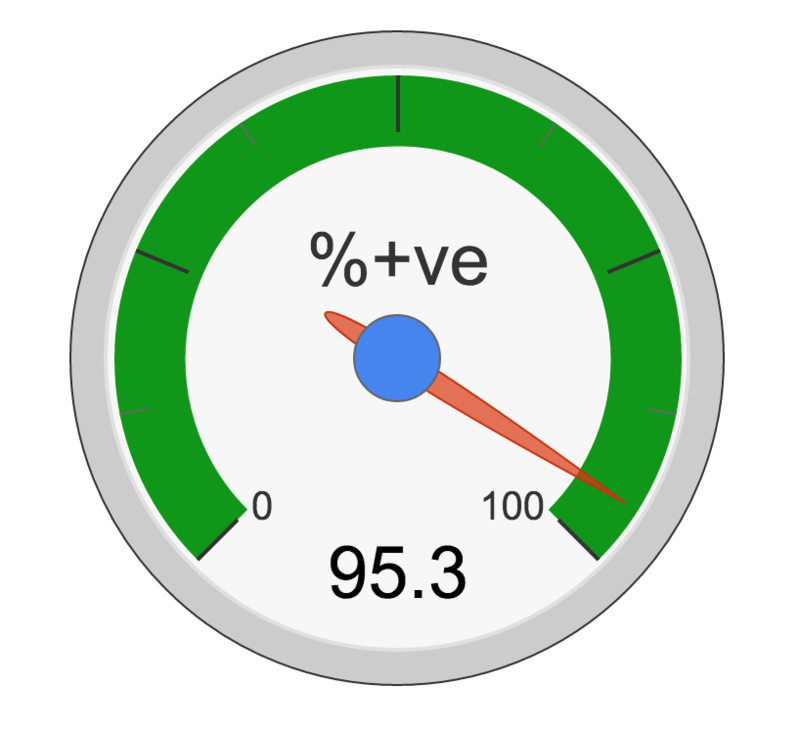 As I write, the survey hasn’t closed but, the initial results are overwhelming at 95.3% positive sentiment. I have a dozen clients now all using the same WordPress theme for their intranets. The intranets are all different. They have their own tones, from cosy and friendly to vibrant and alive to formal and reserved. Sure, they all have their own style, typeface and colour scheme too. But it’s the content and what staff do with the theme that makes them different. Once you delve beyond the “look and feel”, what’s really important is the content. Both corporate content and staff-generated content. It’s the difference between a lonely news story and a blog post filled with comments, between a letter from the Perm sec and a phone number to call. 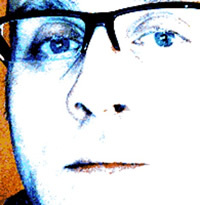 Do intranets need an archive machine? 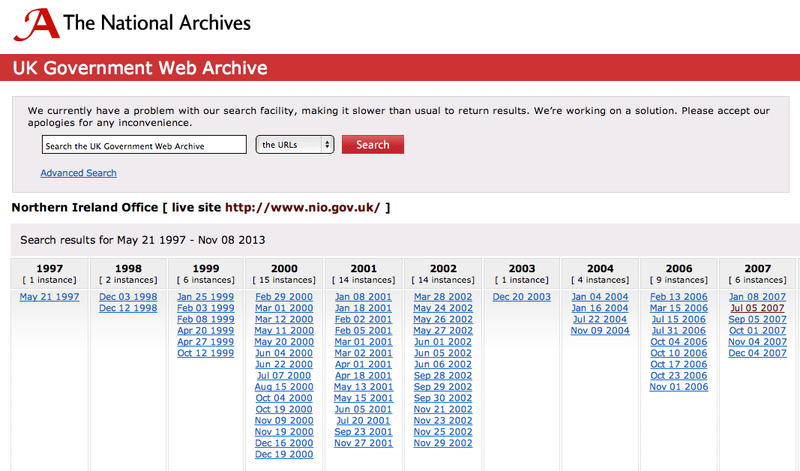 We’ve all used the UK Government Web Archive by The National Archives. It’s a great way of viewing a snapshot of a website at a particular moment in time. I’ve used it myself for compiling screenshots of a site’s redesign history. Do we need something similar on our intranets? Is there a case for going back to a snapshot of the intranet at a particular date? I think there is. And it usually boils down to legal reasons where evidence is required to settle a dispute or clarify information. Take the example, where a Trade Union rep asks to see a copy of the conduct and behaviour policy from 2 years ago for use in an Employment Tribunal case, operating under the rules in place at that time. You updated the policy on the intranet 6 months ago with a new document from HR, overwriting the existing policy so as not to clog up the intranet with numerous variations of documents. After all, the intranet is not an electronic document management system. There are other platforms outside the intranet to store documents, such as the fabulous TRIM. Your efficient HR department haven’t bothered to keep the documentation up to date in TRIM. They think the intranet is the place to store endless versions of their documents. So they are up in arms when they discover that you haven’t done their work for them. You end up having to go to your IT department to restore a backup of the intranet from 2 years ago and you manage to extract the PDF document in question. Now compare that with being able to point your HR people to your intranet archive where they can navigate back 2 years and get a copy of the document in minutes. Many of our clients use WordPress-driven websites and intranets. Tags are a core feature of WordPress. Keywords are not. But we do use them on intranets. Keywords don’t really pack much punch on the web. They were initially designed to aid search engines in indexing content but due to abuse, search engines have long since ignored them. Keywords on the intranet are a great way for the intranet search engine to index words that wouldn’t otherwise appear on a page. Employee restaurant, staff canteen, lunch menu, food and drink are all words that people might use to search for the lunch menu. Not all of these words will appear on that page. So we use keywords to help people that search using words that do not appear in the main content of a page. And although the search engine will read and index the keywords, these keywords will not appear on the front end pages. You don’t need to repeat words that already exist in the page title or body content again in keywords. Keywords are not obligatory. It’s fine to leave them blank. And I stress this because some publishers will enter any words they can if they feel they have to and this can damage search results. Don’t include your company name as a keyword. It’s really not necessary. Unless the page is specifically about your company and this is the page that should appear in search results if someone, on your company intranet, searches for your company name. When you add a keyword, think of it as an instruction to the search engine to include the page as a possible entry in search results when anyone uses the word in a search query. Be very specific. Keywords are also a good way of promoting internal campaigns. Include the message Search for “funderpants” in an offline poster and make sure that you have the obscure/unique word as a keyword in one intranet page only. Then it will appear all alone at the top of the search results pages, if staff search. Tags are not an alternative to keywords. Tags are for grouping content. They are not designed solely for the search engine to index. And they are visible in the front end. Ideally, you should apply a single tag to more than one page. For example, you can apply the tag “meeting” to pages for booking a meeting room, ordering catering for a meeting, collecting guests for a meeting and how to operate the projector. When adding tags to a page, check that a similar tag doesn’t already exist to avoid creating different variations. If you create a new tag, check which other pages might also benefit from the same tag. The only benefit of this shotgun approach of adding lots of tags is that the visible, front-end content will get indexed. On the web, this is a benefit as keywords are generally ignored. I find, in practice, that publishers fall into two categories. Those who organise and manage their tags, and those who treat tags as keywords. Those who manage their tags will build a controlled vocabulary of words and terms that can be used. On the DCMS intranet there are just 65 tags to cover all the content. You click a tag; you get a nice bunch of pages relating to that tag. Those who treat tags as keywords add them in a less controlled manner. This can result in having hundreds of tags, which in itself is not necessarily a bad thing. It produces pages with lots of tags. But it also produces lots of single tags that apply to only one page. Groupings happen by chance. Variations on words start to appear, on the frontend too. 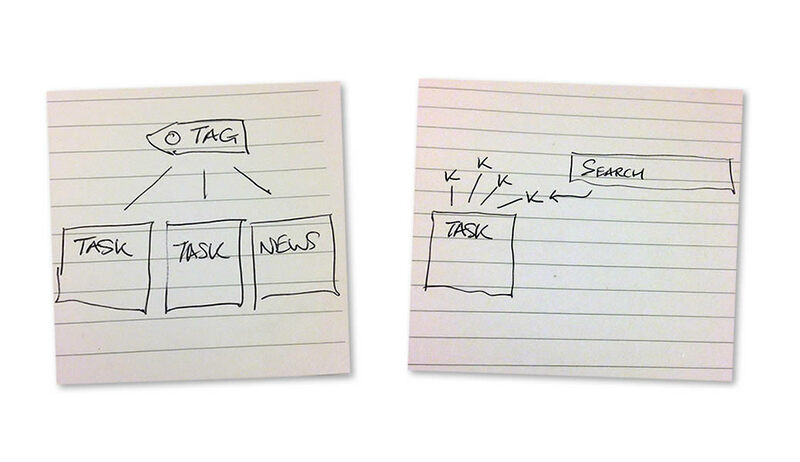 Tag clouds become very flat, as all the singleton tags appear at the same size and colour. You click a tag; you get one page, or a few if you’re lucky. On the intranet, it’s best to use tags to group content, and keywords to aid the search engine.